Paulownia tomentosa (also known as the Empress Tree, Princess Tree or Foxglove Tree; pao tong 泡桐 in Chinese; kiri 桐 in Japanese) is a deciduous tree in the genus Paulownia, native to central and western China, but invasive in the US . It grows to 10-25 m tall, with large heart-shaped to five-lobed leaves 15-40 cm across, arranged in opposite pairs on the stem. On young growth, the leaves may be in whorls of three and be much bigger than the leaves on more mature growth . 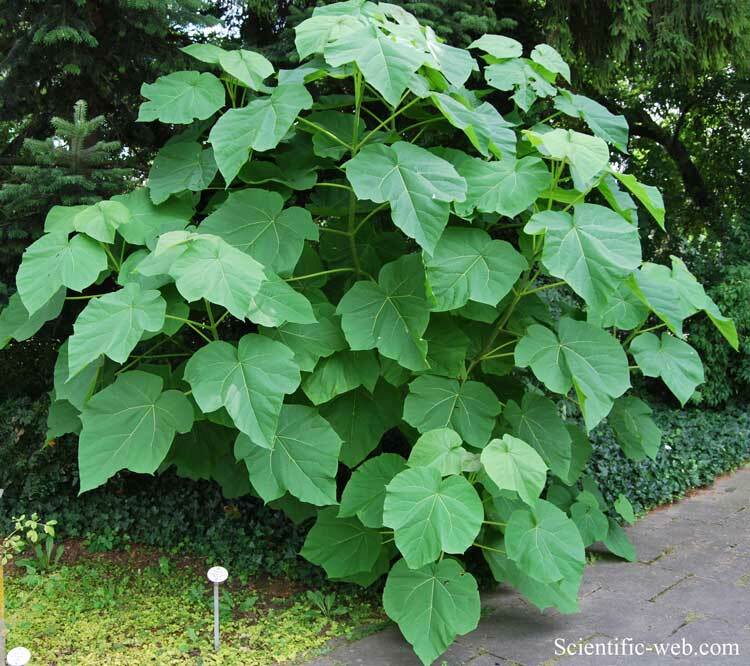 The characteristic large size of the young growth is exploited by gardeners: by pollarding the tree and ensuring there is vigorous new growth every year, massive leaves are produced (up to 60cm across). These are popular in the modern style of gardening which uses large-foliaged and "architectural" plants. The flowers are produced before the leaves in early spring, on panicles 10-30 cm long, with a tubular purple corolla 4-6 cm long resembling a foxglove flower. The fruit is a dry egg-shaped capsule 3-4 cm long, containing numerous tiny seeds. The seeds are winged and disperse by wind and water. Pollarded trees do not produce flowers, as these only form on mature wood. Paulownia tomentosa can survive wildfire because the roots can regenerate new, very fast-growing stems. It is tolerant of pollution and it is not fussy about soil type. For this reason it functions ecologically as a pioneer plant. Its nitrogen-rich leaves provide good fodder and its roots prevent soil erosion. Eventually, Paulownia is succeeded by taller trees that shade it. It cannot thrive in the shade of other trees. In China, an old custom is to plant an Empress Tree when a baby girl is born. The fast-growing tree matures when she does. When she is eligible for marriage the tree is cut down and carved into wooden articles for her dowry. Carving the wood of Paulownia is an art form in Japan and China. In legend, it is said that the Phoenix will only land on the Empress Tree and only when a good ruler is in power. Several Asian string instruments are made from P. tomentosa, including the Japanese koto and Korean gayageum zithers. The soft, lightweight seeds were commonly used as a packing material by Chinese porcelain exporters in the 19th century, before the development of polystyrene packaging. Packing cases would often leak or burst open in transit and scatter the seeds along rail tracks. This, together with seeds released by specimens deliberately planted for ornament, has allowed the species to become an invasive weed tree in areas where the climate is suitable for its growth, notably Japan and the eastern United States. Some geranylflavonoids can be found in P. tomentosa. 4. ^ Tom Remaley (2006-06-27). "Princess tree". Plant Conservation Alliance's Alien Plant Working Group Least Wanted. http://www.nps.gov/plants/alien/fact/pato1.htm.